First of all, we would like to thank you for your support to Aung San Suu Kyi and for organising and honoring “The Freedom of the City” to our leader Aung San Suu Kyi. 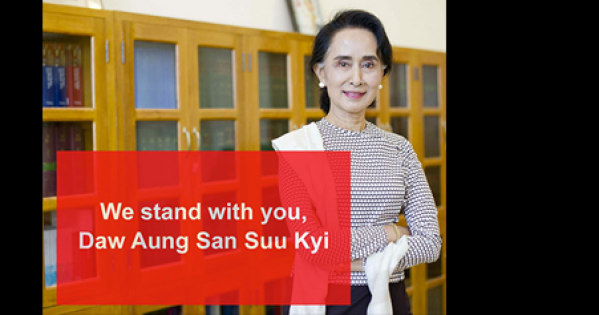 Although you have honoured and encouraged our leader Aung San Suu Kyi and her government, there are a few people who are still against her and her government’s works for their own benefits. However, Burmese Rohingya Organization UK, Restlessbeings and Kachin National Organization UK who are going to host the demonstration outside the Guildhall where the award ceremony has taken place. The accusations to the State counsellor are not founded and they have totally ignored the facts of her tireless and dedicated works but they are using this opportunity to gain attentions for their organizations and personal benefits. Therefore, we would like to denounce the upcoming demonstration against the State counsellor’s state visit. For these reasons above, we sign hereby below to show our solidarity to condemn the demonstrations and its participants strongly. Myanmar. NLD led government has been working so hard and working on implementing the points from Dr Kofi Arnan commission recommendations. Reporting to the world with one sided narrative and blaming to the issues based on lack of the real facts, ignoring of historical context will lead to go more divides. Therefore, for harmony, peace and progress in any issue related areas, we believe Daw Aung San Suu Kyi led government approach is the right way and we have organised this online petition to let world know that Myanmar Community in United Kingdom stand with Daw Aung San Suu Kyi. If you would like to contact petition organisers, please see below.